blog.HalloweenAdventure.com | Latest News from the Costumes Trend FrontLines! : Cinderelly, Cinderelley, Night and Day it’s Cinderelly! Cinderelly, Cinderelley, Night and Day it’s Cinderelly! Deep down, every girl’s dream is to be a Disney princess, whether she admits it or not. Girls grow up to be women, but the desire to be a princess never ceases. Here at Halloween Adventures, we believe every woman is a princess, no matter what her age, so we present you with the Disney princess costumes: for adults! One of the favorites? Cinderella, of course! The girl with the glass slipper, who spent her days and nights mopping and sweeping and cleaning up after her horrendous stepsisters. But, as we all know, Cinderella soon morphs into a gorgeous girl in a dress fit for a queen! 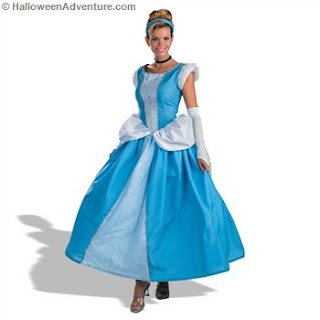 Our Cinderella Prestige Costume is made for the woman who wants to relive her childhood dreams of a princess life. This costume is a Disney official, so you know it’s the real thing! It includes a full-length dress with attached petticoat underneath, as well as white cap sleeves, a pair of white gloves and a black choker. Glass slippers aren’t included, but can be found here. 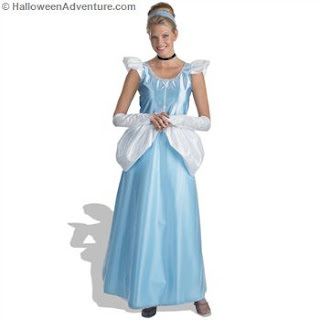 Those who love Cinderella might also want to check out our Cinderella Deluxe Costume. It includes a full length light blue Cinderella gown with long shimmer overskirt, sash with attached white polka dot peplum, black choker, gloves, light blue headband with white polka dots, and slip. Prince Charming isn’t included, but wearing this dress, you’ll probably find him! Another princess favorite is Arabian beauty Jasmine. Jasmine steals the heart of Aladdin and mesmerizes all around her with her delicate exotic looks. 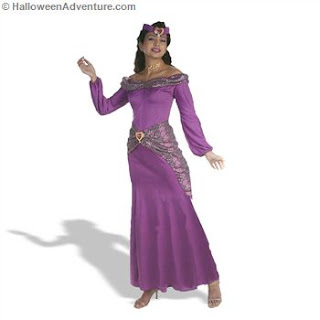 Our Jasmine Prestige Movie Costume includes a long regal purple gown with iridescent skirt drape, simulated jewel choker and matching headpiece. Pair with Aladdin for a magical couples costume. If you’re looking to go the scary route, check out our amazing Maleficent Deluxe Costume. This scary queen from Sleeping Beauty takes the cake as one of the most awesome evil temptresses in Disney history. This outfit allows you to replicate the fabulosity that is Maleficent’s full-length tunic gown, and incredible horn-like headpiece. Just don’t be surprised if the little kids run away screaming. We know it’s not intentional, nor is it your fault, but this is one scary costume! No matter which Disney girl you choose, you’re sure to rock a slammin’ costume. You can never go wrong with a princess or a queen, especially when they’re Disney! Happy Halloweening!